A voz passiva no Inglês é muito parecida com o Português. Vamos ver como funciona? Estude com o Curso Enem Gratuito! Para a gente começar a conversar, precisamos esclarecer a diferença entre voz passiva e voz ativa. A voz ativa acontece quando o sujeito realiza a ação expressa pelo verbo. Lembrando que para transformar um verbo regular na sua forma básica em Past Participle, é só acrescentar “ed”. Já os irregulares, é usar e memorizar mesmo, como no exemplo acima. Outro detalhe muito importante é manter o tempo verbal de uma oração na Voz Ativa para uma oração na Voz Passiva. 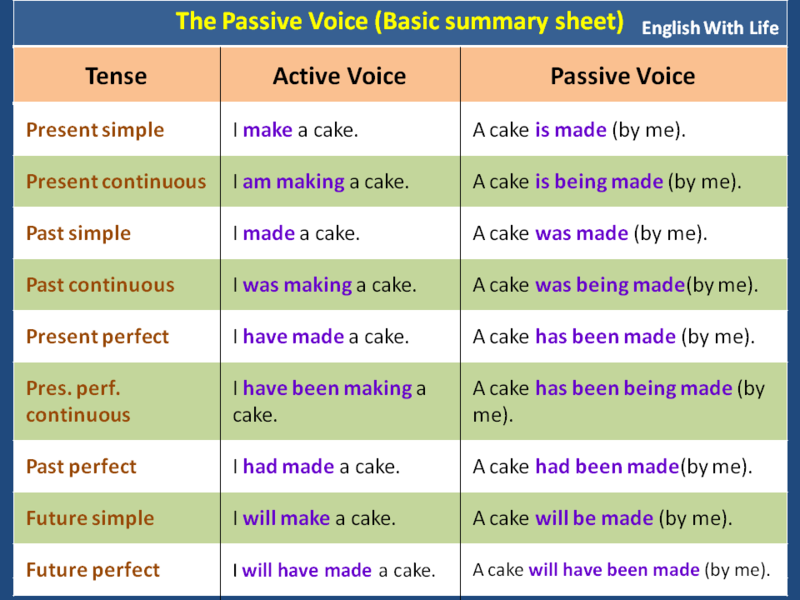 Observe que na Voz Passiva, o tempo verbal é sempre expresso pelo verbo To Be, sendo que o verbo principal permanece no Past Participle. -Many people begin new projects in January. -New projects are begun by many people in January. – We lost the mail again. -The mail was lost again. -The doctor will examine you. -You will be examined by the doctor. – I have taken this course before. -This course has been taken by me before. Na voz passiva, utilizamos o Pronome Objeto “me” em vez de “I” devido à preposição “by”. Na voz passiva, utilizamos “has” devido ao nome em terceira pessoa do singular “the course”. – We had finished the exercises when the teacher arrived. -The exercises had been finished by us when the teacher arrived. – You should wash that shirt. -This shirt should be washed by you. Para que não lembra, para utilizar os modais em inglês, é só acrescentar modal + verbo principal na forma básica. Por exemplo: You should go (Você deveria ir). Escolha a opção com a forma mais adequada na voz passiva das sentenças em negrito, que estão na voz ativa. 1. Mary wrote the email. A. The email was written by Mary. B. The email is writen by Mary. C. The email was writen for Mary. 2. They buy old books. A. Old books are buy. B. Old books are bought. C. Old books is bought. 3. The president will give a speech. A. A speech will be given for the president. B. A speech will not be given by the president. C. A speech will be given by the president. 4. Britney made a decision. A. A decision was made by Britney. B. A decision is made by Britney. C. A decision is made for Britney. 5. Allan has painted the house. A. The house has been painted by Allan. B. The house was been painted by Allan. C. The house is painted by Allan. 6. The news shocked the family. A. The family is shocked by the news. B. The family was shocked by the news. C. The family been shocked by the news. 7. The earthquake hit the city’s most important administrative buildings . A. The city’s most important administrative buildings were hit by the earthquake. B. The city’s most important administrative buildings are hit by the earthquake. C. The city’s most important administrative buildings were hit for the earthquake. 8. He wrote five important books. A. Five important books were written by her. B. Five important books are written by him. C. Five important books were written by him. 9. They are building a new house. A. A new house was being built. B. A new house is being build. C. A new house is being built by them.